Congratulations to David Diaz, Winner of Event #12: $1,500 Triple Chance No-Limit Hold'em ($352,808)! David Diaz wins Event #12! 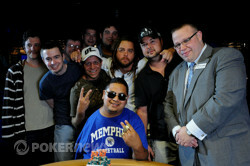 It took nearly 28 hours of play to eliminate 1,339 players but for David Diaz, it was well worth the wait. With just four tables left, this tournament still had the likes of Sam Trickett, Cliff Josephy, Bill Chen, Andy Black, J.C. Tran, Getty Mattingsly and Dan Smith. But Diaz was able to overcome them all, including a head up match with the talented Anders Meli. 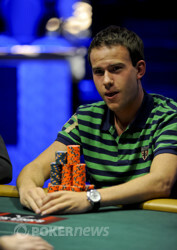 He will be taking home his very first WSOP gold bracelet and $352,808 for his skill and patience. We started the final day with ten players and Diaz entered just 9th in chips. He stayed out of the heavy action early, finding spots to add chips when he could including a bluff with Ten-Three. It wasn’t until he got it all in with our Day 2 chip leader Nicholas Rampone that he took the chip lead for the first time. His got there on the turn against the of Rampone. However, it wasn’t long before he got short again and in back to back hands had to come from behind in an all in preflop situation to chop both of the pots. But then it happened. Shortly after doubling up and reaching a million chips, Diaz flopped the nut flush against the second nut flush draw of Bill Chen. The two got it in and Diaz took a chip lead that he refused to relinquish. With play three handed, Diaz continued to put pressure on the two shorter stacks, Andrea Dato and Anders Meli. Dato tried to fight back but the aggressiveness of Diaz caught up with him. Anders Meli was able to gain a little momentum before Dato’s bust but when the battle turned heads up, it was all downhill from there. Diaz poured on the aggression, forcing Meli to chip down further and further as the match progressed. On the final hand, Meli’s couldn’t hold against the holding of Diaz and we had a champion. When asked if he had expected to win a bracelet his year at the World Series, Diaz responded, “Actually, I expected to win two. I don’t know why but I just did.” Well, David Diaz, you are half way there. 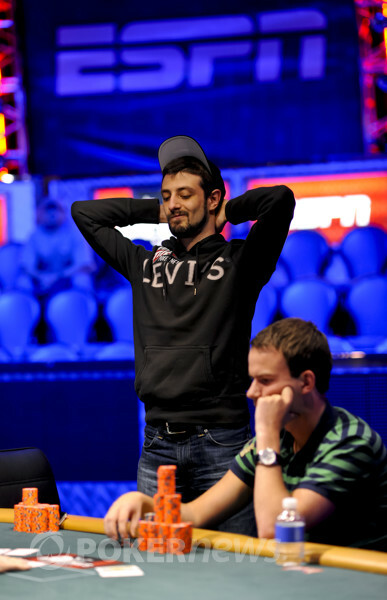 David Diaz opened for 100,000 and Anders Meli moved all in. Diaz called and the hands were tabled. A coin flip was to decided the tournament. 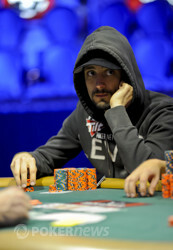 Diaz paired his ten on the flop and had a small sweat on his way to winning his first WSOP bracelet. On a flop of Diaz check-raised a 50,000 bet from Meli to 250,000. Meli called and the turn came . Diaz again checked, Meli bet out 275,000 and Diaz moved all in. Meli folded his hand and continues to lose chips to Diaz. David Diaz has been betting and dragging the last few pots. Anders Meli can't seem to gain any traction has slipped in chips. David Diaz opened for 125,000 and Anders Meli raised to 250,000. Diaz then popped it to 425,000 and Meli five-bet to 750,000. After some thought Diaz released his hand and Meli dragged a sizable pot without ever seeing a flop. Andrea Dato moved all in preflop for just over 800,000 and David Diaz called. Dato was strong with and Diaz was looking for a knockout holding . Diaz hit the flop by pairing his four and sent Dato home in third place to the disappointment of his Italian rail. Andrea Dato and Anders Meli chop a pot.